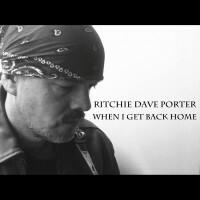 I like Ritchie Dave Porter! These days, many artists seem to strive for the next best thing, trying to stretch themselves too far, with ambitions beyond their current hemisphere. The problem is, that ambition might as well be in the next galaxy, because they just ain’t going to get there when they don’t have what it takes to get lift off. 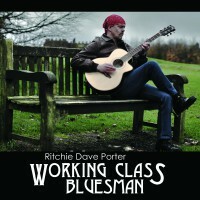 This ‘working class bluesman’ is more honest with himself, and that’s what I like about his music – he sticks to what’s in his heart and in his bones. And why does he do this? Because he sings the blues and he’s pretty darn good at it! I’ve never met Ritchie, but have got to know him a little through the powers of the internet, and the lyrics he writes seem to come directly from what’s happening in his life. When he sings “I can make it alone, because I sing the blues” on ‘Dog Without a Bone’ he also teaches us that he can do double meanings as well as anyone. 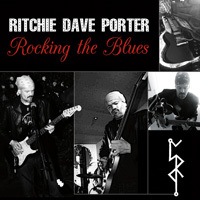 The lyrics on this and a number of Ritchie’s songs leave listeners in no doubt that he has an eventful and never smooth love life, and here he tells it like it is – singing the blues gets him through. So where’s the double meaning, you might ask. Well, I thought that the song might also relate to his musical ambitions. I’ve wondered why Ritchie’s doesn’t have a band, but he’s obviously convinced that he can make it on his own, and with talent like his, it’s hard to argue with him. But…. ….and in the middle of this otherwise exclusively acoustic album, we get the one track where he plays electric guitar, something I for one would like to hear more of (the mirror image, with just one acoustic track, for the next album perhaps?). ‘Happy Home’ ends suddenly when someone pulls the plug and tells him he passed the audition to join their band. It’s a neat trick to get the hard-edged blues-rock track onto the album. It also suggests that maybe Ritchie craves to lead a band? Then again, the very next number, ‘Let Me Tell You About The Blues’, demonstrates exactly why there’s no need for him to change. There’s some absolutely beautiful string work on this track. Many of Ritchie’s songs follow a traditional blues structure. However, he demonstrates his versatility and excellent musicianship in songs like this, which I’d pick out as my favourite track on the album. There’s a problem here though – it’s only three minutes long, and I could have listened to much more of that guitar playing. The following track, ‘My Father’, is another individually styled and structured song, with some lovely riffs right though the number. 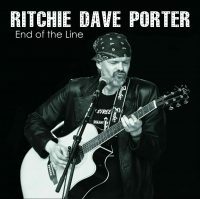 The title track on the album, ‘End of the Line’ also has a few sumptuous solos. It starts with some beautiful simple, almost bass, notes that vaguely reminded me of an equally brilliant track called ‘Closer’ by Nikki Loy, on her album ‘Pivotal’. Ritchie sings “I was searching for love, but I need to find peace, I was looking for love, but love’s a broken dream…just let me play my guitar!” – and there you have it…he found his number one love, and he has it in his hands, making beautiful sounds! The contrast between these and the more conventionally styled blues numbers really is a feature of this album. It’s a very well balanced collection of songs stripped bare – just vocals and a guitar. Two intricate and hugely enjoyable instrumentals, which are as much akin to classical guitar playing as blues, provide the bookends to this library of songs from the heart. 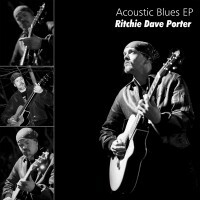 They really are top quality, and demonstrate that Ritchie Dave Porter has tremendous skill in those fingers of his, and he deserves great credit for this collection of work.